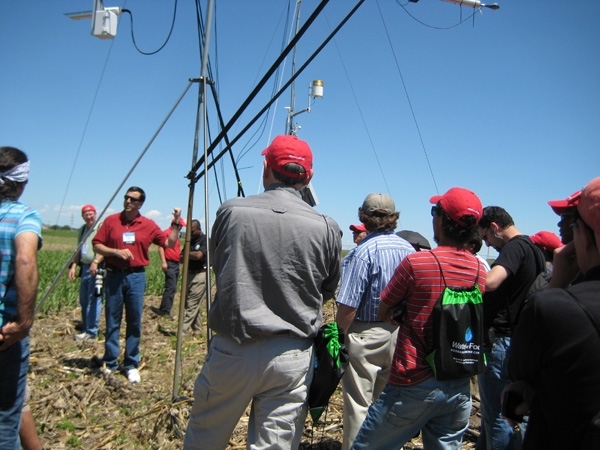 The University of Nebraska, Lincoln, hosted a group of Water for Food Conference participants on a tour of the UNL South Central Ag Laboratory in Clay Center, Neb., June 2. At the 640-acre facility, research aims to develop and refine irrigated crop production practices for Nebraska agriculture. Many of the ag practices being studied at the center parallel work being conducted at the University of California's West Side Research and Extension Center in Five Points. Field projects at the Clay Center facility include corn produced using conservation tillage practices and irrigated with subsurface drip and overhead systems. 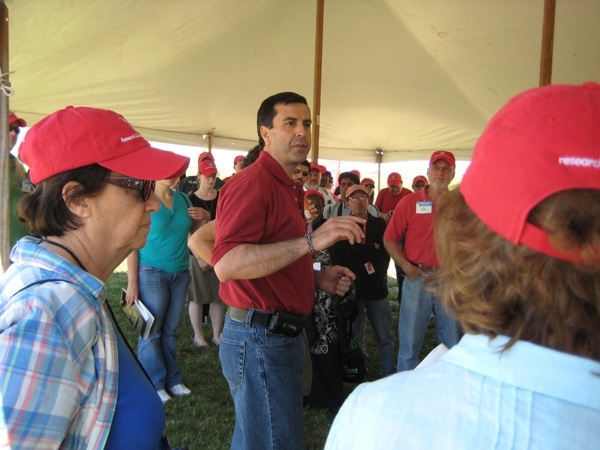 UNL professor of biological systems engineering Suat Irmak hosted the tour. Irmak leads the Nebraska Agricultural Water Network, in which 900 Nebraska farmers are involved in an effort to increase adoption of new tools, technologies and strategies for increasing crop water productivity and reducing energy use in agriculture. UNL professor Suat Irmak said California agriculture used to be very good about adopting new technologies. "Now Nebraska is No. 1," he said. High technology equipment at the Clay Center continuously monitors crop evapotranspiration and crop coefficients of corn during the growing season. 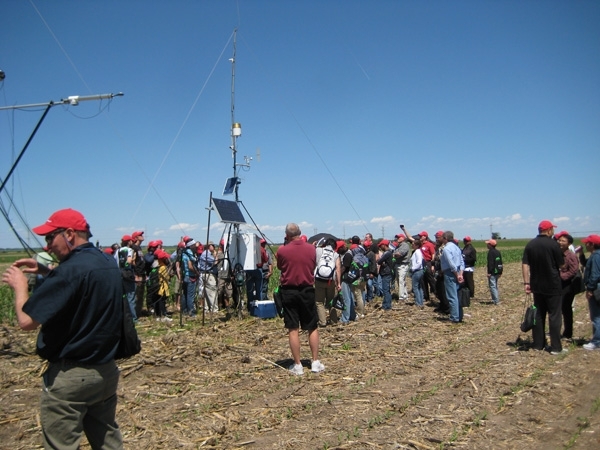 Tour participants gather around the $55,000 evapotranspiration research equipment. Nebraska leads the nation in implementation of overhead irrigation technologies. Research is continuing to ensure the most efficient use of these systems. Dan Munk (left) and Michael Dowgert, the Fresno-based director of marketing for Netafim, an irrigation company. Farmers, researchers, consumers and policy makers are making progress toward addressing the challenge of producing food to feed a world population of 9 billion in 2050. The optimistic signs were everywhere on the closing day of the fourth annual Water for Food Conference in Lincoln, Neb., June 1. Scientists described highly technical basic research at the plant genome level to develop crops that produce sufficient yield, even under drought conditions. Policymakers compared notes on innovative water governance strategies. Farmers talked about implementing high-efficiency irrigation and tillage techniques. University researchers outlined efforts to fine-tune crop production systems. People from the four corners of the earth shared novel ways - like reducing food waste and moving away from water-intensive diets - to achieve a common goal. During the final panel session on Friday, interim director of the Nebraska Water Center at the University of Nebraska, Lincoln, Suet Irmak, said that, in addition to finding solutions, in order to close the gap in food need, education and extension are critical. "Somebody has to take the research to the farm. That will make the real impact on the ground," Irmak said. Dan Munk, University of California Cooperative Extension advisor in Fresno County, agreed. Munk, a water and soils expert, was one of seven members of a California delegation that attended the conference for the first time. As far as California farmers have come in terms of water management, he said, there are still efficiency gains to be made by increasing soil moisture monitoring, improving irrigation systems and refining the way irrigation systems are managed. "We are seeing more and more farmers (in California) use soil moisture sensors, measure crop stress, meter water and switch over to pressurized irrigation systems like drip, micro sprinklers and overhead systems," Munk said. But more must be done. Munk is a member of the executive board for Conservation Agriculture Systems Innovation (CASI), which is seeking to further promote improved crop production and irrigation systems throughout the state. During the closing panel on Friday, Simi Kamal, chair of the Hisaar Foundation in Pakistan, said that the global nature of the Water for Food Conference has revealed similarities among the diverse partipants and new ways for people to work together. "At the 'Women, Water and Food' panel discussion, we concluded that there is a common thread," Kamal said. "All we have to do is pick it up and stitch it together." 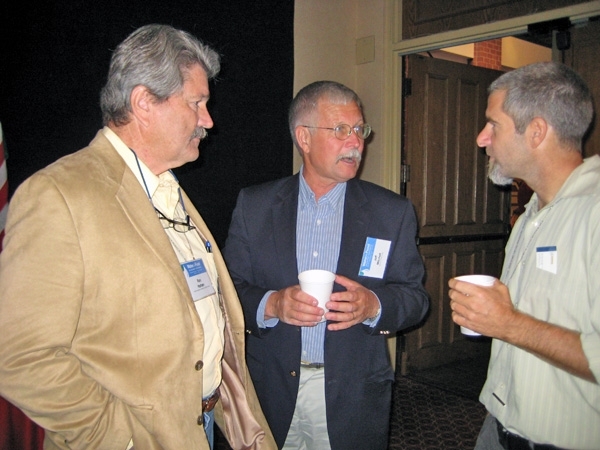 CASI executive board member Ron Harben (left) and UC Cooperative Extension cropping systems specialist Jeff Mitchell (center) speak with Paul Hicks of Catholic Relief Services during a break at the Water for Food Conference. Conservation Agriculture Systems Innovation (CASI) has a vision for California – a vision in which farmers make more money while using less water and protecting the environment. However, the organization has been frustrated that the progress in getting these ag systems adopted by farmers has been rather slow. 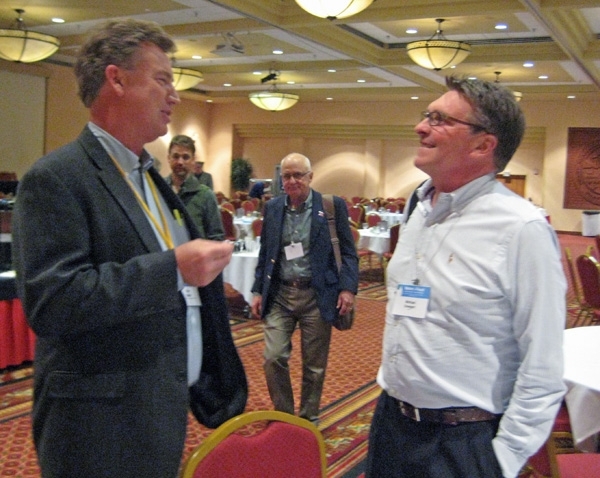 A member of the CASI executive board and a project director with the California Association of Resource Conservation Districts, Ron Harben, brought up the point with a panel of industry experts at the Water for Food Conference in Lincoln, Neb., May 31. Panelist Natalie DiNicola, Vice President of Sustainable Agriculture Partnerships at Monsanto, responded. She said her experience has shown that before adopting new methods, “farmers need to see it for themselves. DiNicola noted that Monsanto has a water utilization learning center in Gothenburg, Neb., where growers are invited to see water utilization and technologies research first hand. The 324-acre research farm is the site of multiple cropping system demonstrations focusing on the challenges farmers face in high-plains agriculture. Nebraska farmers have demonstrated their willingness to adopt new technologies in their farming systems. In the 1970s, extension educators conducted research on how center pivots could be installed and managed in the field. 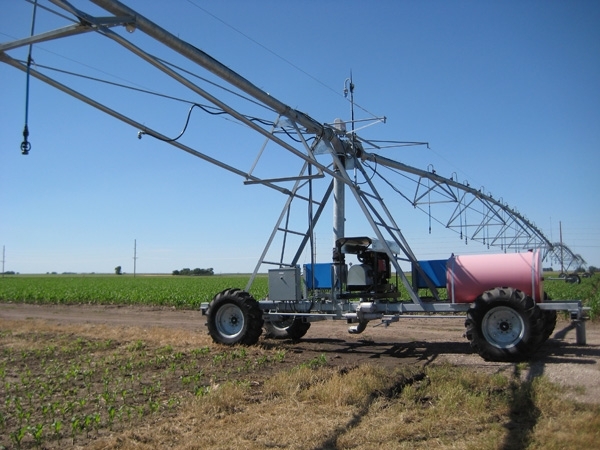 Still, in the early 1980s, only 40 percent of farmers used overhead center pivot irrigation systems. Restrictions on water use were imposed as the result of a 1998 lawsuit in which the State of Kansas alleged Nebraska had violated a longstanding water agreement by allowing farmers to drill thousands of irrigation wells along rivers and tributaries, according to William Kranz, a University of Nebraska extension irrigation specialist. The suit between the states was settled, and water use restrictions implemented in Nebraska, but the issue of water sharing is still contentious. Because of the water restrictions, furrow-irrigated acres in Nebraska’s North Platte Valley were converted to center pivots at a rate of about 10,000 acres per year between 2000 and 2010. Today, 85,000 center pivot irrigation systems are used in Nebraska. “It was an economic decision for farmers,” Kranz said. Though not faced with the same challenges in water availability, CASI is working with innovative farmers in the California Central Valley to put together an educational initiative aimed at communicating the benefits of conservation agriculture approaches and encouraging more growers to implement this type of farming system. Benefits include reductions in fuel use, production costs and dust emissions; and increases in carbon sequestration and irrigation efficiency. CASI plans to share information about conservation agriculture with growers by initiating an information outreach campaign, acquiring equipment to share with farmers, planting conservation cropping systems demonstration projects throughout the Central Valley and establishing a farmer training and farm educator program. The organization is currently undertaking a development campaign to generate funding for this ambitious effort. Water for Food Conference growers panel. The confluence of global climate change and population growth is brewing a “perfect storm” that threatens the availability of sufficient fresh water to grow food to feed the world by 2025, warned Colin Chartres, the director general of the International Water Management Institute in Sri Lanka. 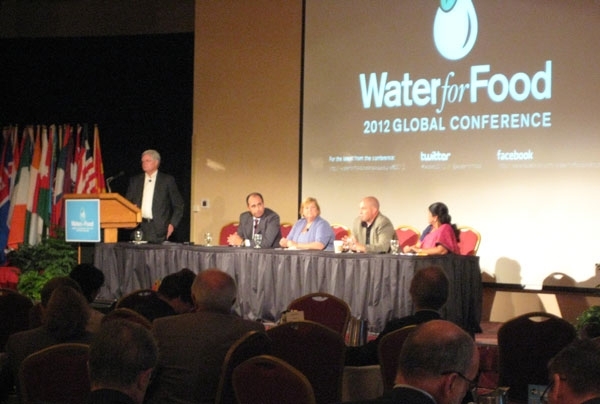 Chartres spoke at the Water for Food Global Conference in Lincoln, Neb., May 30. More than 500 attendees from 28 countries on 6 continents have convened in Lincoln to address the challenges of food security in relation to water supplies. The conference continues through Saturday. Healthier diet: Currently, producers grow food to provide about 2,800 to 3,000 calories per person per day, including 224 grams of meat. If people instead were to eat a healthier diet with much less meat (an average of about 90 grams), the world would realize water savings of 1,350 cubic kilometers. “By anybody’s standard, that’s a lot of water,” Chartes said. Reduce waste. Currently, a tremendous amount of food is thrown away at the point of production and the point of consumption, representing a significant waste of water used in the food production. Encourage trade. Grow water-hungry crops in water-rich areas. This concept is already driving geo-politics, Chartes said. Water-scarce countries are thinking about where to get their food in the future. Increase productivity. Produce more crop per drop in irrigated and rain-fed agricultural systems. The efforts of the Conservation Agriculture Systems Innovation (CASI) workgroup can play a role in preventing the “perfect storm” in California, the United State’s No. 1 ag producer. CASI’s research and education programs will allow farmers to grow more food with less water by helping them convert flood irrigation systems, currently used on 57 percent of the state’s cropland, to more water efficient irrigation systems, such as mechanized overhead and subsurface drip systems. Combining the efficient irrigation with conservation tillage saves still more water. CASI research has shown that systems with improved application efficiency can cut irrigation water requirements by 10 to 30 percent. During the producer’s panel discussion at the Water for Food Conference, two American farmers – one from Nebraska, the other from Iowa – described their use of conservation tillage techniques and mechanized irrigation to increase farm efficiency. Farmer Brandon Hunnicutt works 2,600 acres with his father and brother on a Nebraska farm that has been in the family for 100 years. He said they have made tremendous strides in reducing inputs – tillage, water, fertilizer and pesticides – using mechanized irrigation equipment, conservation tillage and Watermark soil moisture sensors. The sensors send information to a cellphone or tablet computer for real-time remote monitoring of the moisture being held in the soil. Farmer April Hemmes of Iowa said she believes precision farming techniques will be particularly important in the future. For example, on her farm, they have mapped all the soil and apply fertilizer at a variable rate. CASI chair Jeff Mitchell, UC Cooperative Extension specialist in the Department of Plant Sciences at UC Davis, said the Water for Food Conference has provided an inspiring large-scale perspective on emerging global issues that people from around the world are working on. He complimented the University of Nebraska, Lincoln, sponsor of the Water for Food Conference, for the coordination of their initiatives to address global water issues and the success they have had in establishing the Water for Food Institute.